Take an inky road trip with a liar (Alvin Crabshack) into the generally ignored world of mask wearing freaks and monsters both dead and alive. Folk tales are made up by regular schmucks in party houses, caves and vans. Are you concerned about the eggs? Alvin has a story for whoever he meets, including you. 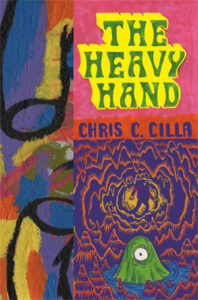 Cult cartoonist Chris Cilla (The Diplomat) gets the “graphic novel” treatment, heads have been waiting.